Virginia Union cheerleaders perform during a break. Central Intercollegiate Athletic Association (CIAA) Player of the Year Robert Davis III was featured in Friday’s final game when Johnson C. Smith took on Bowie State. Davis, a JCSU senior guard from West Friendship, Maryland, is also the league’s leading scorer, averaging 21.9 points a game. Oh, and he also leads the league with an 88.2 free throw percentage and is second in 3-pointers made (75). He had nine points by halftime Friday night, with the Golden Bulls holding a 37-31 lead over the Bulldogs. JCSU eventually won 80-71, with Roderick Ross leading Smith with 20 points. Davis finished with 18. From a distance, Davis bears a slight resemblance to Oklahoma’s 6-foot-2, all-everything guard Trae Young, but Davis is not the assist machine that Young is. And because Davis plays in Charlotte, North Carolina, some people want to make comparisons to Stephen Curry, listed at 6-foot-3, who played high school ball in Charlotte and later up the freeway at Davidson College. Davis also is not the ball handler that Curry was in college, but Davis didn’t have the luxury of honing his skills with a father who was an NBA sharpshooter. If there is an immediate drawback for Davis, whose father is a pastor at a Baltimore-area church, it might be size. He’s listed at 6-foot-1, and usually when a college lists your height, it tends to be generous by an inch or so. Clearly, he would be a much better prospect at 6-foot-4. Further support for the size-does-matter theory is also right here in Charlotte, where rookie NBA guard Malik Monk, a 6-foot-3 scoring machine at Kentucky, is struggling to stay on the floor for the Hornets. Davis might have an optimal package to make it in the world’s second-best professional basketball league — in China, where 6-foot-2 guard Jimmer Fredette, a prolific college scorer at Brigham Young, has become an international sensation. But you never know: How many people thought Steph Curry would rewrite the standards for professional guard prospects? Virginia Union senior James Paige revealed why he and fellow senior Kory Cooley (29 points) had to win on Friday night. “We had to play on Saturday; tomorrow is me and Kory’s birthday,” Paige said. VSU Trojan # 11 Cyonte Melvin reaches to block VUU Panther # 10 Kory Cooley as he drives to the basket. VUU coach Jay Butler threw both hands open in disbelief. “I had no idea,” said Butler, who won three CIAA tournaments as a player at VUU. “I want to win a ring as a coach,” he said. The Panthers upset top seed Virginia State 67-52, but the Trojans are almost a lock to be granted an at-large bid to the NCAA Division II tournament. But can the two seniors add icing to that birthday cake with a victory on Saturday night? 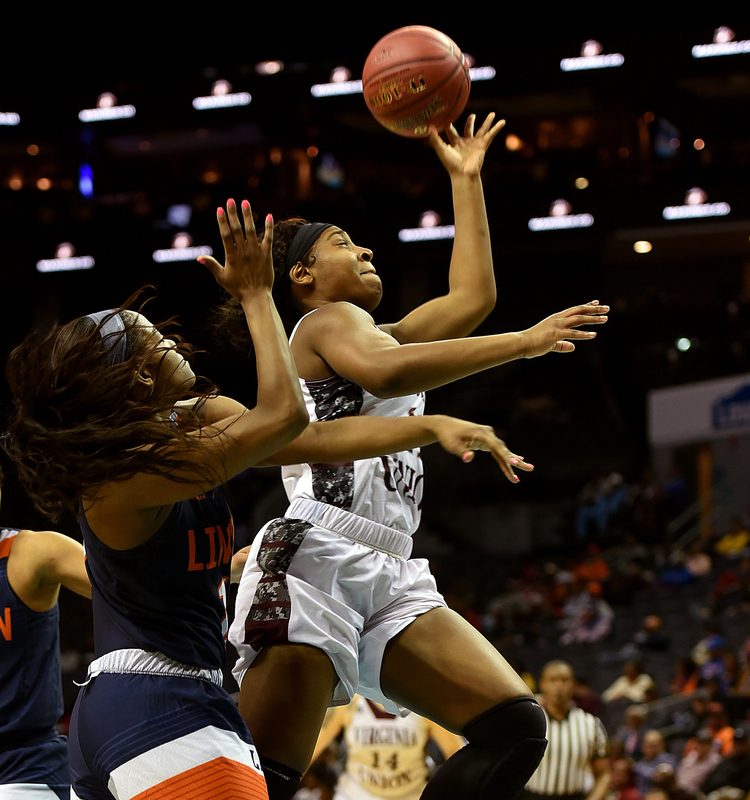 CIAA Player of the Year and Defensive Player of the Year Alexis Johnson had a Friday stat line of 20 points, 11 rebounds and 5 blocks as Virginia Union beat Lincoln (Pennsylvania) 73-50 to advance to Saturday’s 1 p.m. championship game against Bowie. Johnson, a senior, wears No. 23 — but for this millennial, does that number represent LeBron James or Michael Jordan? Well, give the young woman credit: She is playing in Spectrum Center, home of the NBA’s Hornets, of which Jordan is majority owner. For most of the teams playing in this week’s CIAA tournament, it’s win or go home — until next fall. Not so for Virginia Union (26-2), which is ranked No. 4 nationally and almost assured an NCAA Division II tournament bid if it is inexplicably eliminated. The Panthers were eliminated in last year’s semifinals and rode an at-large bid to the Division II national title game, where they lost 93-77 to Ashland, which polished off a 37-0 campaign. The defending champion Eagles (28-0) are ranked No. 1 in the nation. Bowie State’s Kiara Colston drilled a 3-pointer with 16 seconds left in the game to push the Bulldogs to a 53-49 upset of Virginia State in Friday’s first women’s semifinal. Virginia Union #21 Kishona Sutton and Lincoln University #32 Sahara Madison jump for rebound down court. Colston led all scorers with 23 points. Despite the loss, Virginia State’s season is likely not over, as the Trojans could receive a bid into the NCAA Division II tournament, which starts in another week. 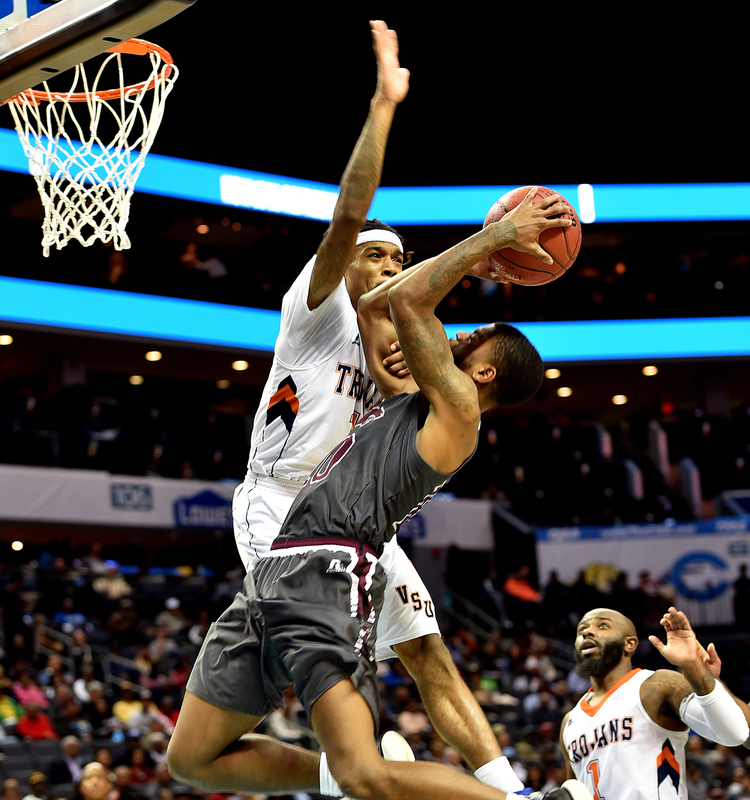 Virginia State coach James Hill Jr. saw a couple of reasons for his team’s early exit: First off, the Trojans gave up 23 points off 24 turnovers, and second, the defense was lacking on Colston’s dagger, which came as the shot clock was about to expire. No Trojan player had a hand in Colston’s face. Or in this case … woman. On the other side, Bowie coach Shadae Swan has her team in the CIAA championship game for the first time since 2000. Expect Bowie to play hard in Saturday’s 1 p.m. championship game against Virginia Union, but you can expect the national runner-up Panthers to win. To start off Friday’s sessions, the singing group known as The Hamiltones sang the national anthem. The Grammy-nominated group, backup singers for Grammy winner Anthony Hamilton, nailed “The Star-Spangled Banner” with a harmonized rendition. Where were they when the NFL was commissioning Pink to sing (butcher) the anthem before Super Bowl XLII? For the black national anthem, “Lift Every Voice and Sing,” the sparse midday crowd was led into a singalong by Sunshine (“Heard It All Before”) Anderson, an alumna of former CIAA member North Carolina Central University. Maybe it’s not too late for her to follow up on the 2001 smash hit, which became a trash-talk woman-to-man anthem and landed her in the one-hit-wonder hall of fame. Saxophonist Mike Phillips blew out a soulful version of the national anthem to help get the night session of men’s games off to a rousing start. Phillips gained popularity through appearances at Atlanta Falcons football games, which prompted the hashtag #saxthem and attracted 3.1 million viewers on the NFL’s Facebook page.